In this second part of a series on building a DJ template, Dubspot’s Rory PQ takes us through the steps of building DJ effect racks triggered by Dummy Clips. Included is a FREE Ableton Live DJ Effect Racks. Check out our DJ / Producer Master Program, classes start soon. Enroll Today! 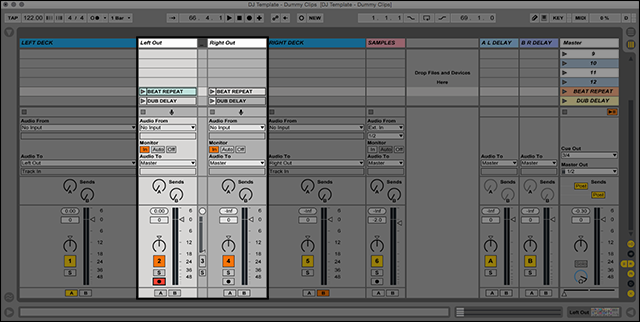 In the first part of our series on building a custom DJ template in Ableton Live, we looked at how to build a basic DJ template. In this second part of the series, we will build up the DJ template further and create two additional Audio Effect Racks that will be triggered by Dummy Clips. Before we get the party started head over to the first tutorial in the series HERE and download the FREE Ableton Live DJ Template. We will use this template as the foundation for creating Dummy Clips that will trigger a Dub Delay rack and Fading Beat Repeat rack, which can both be downloaded by filling out the form below. A Dummy Clip is not what you call your buddy when he gets his hand stuck in peanut butter jar. 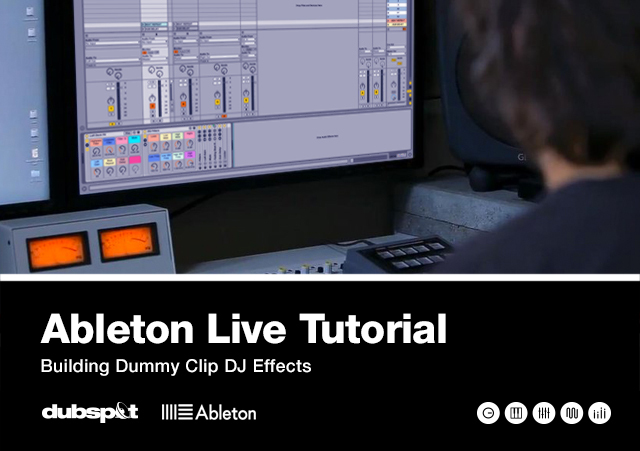 The term Dummy Clip is used to describe an empty Audio Clip that contains automation for modulating a specified parameter of any device in Ableton Live. Dummy Clips are used to trigger automation only and are not intended to playback any audio. You may ask, “Why trigger an audio effect using a Dummy Clip rather than directly from the device or Macro control?” There are several reasons; first it allows you to have more control over how an audio effect reacts after its triggered. With a single push of a button, you can control the behavior of multiple parameters, as well as define exact parameter ranges. For example, you could automate a filter frequency control to open up to 10 kHz over a specified amount of time while also activating a Beat Repeat device with a single push of a button. The creative possibilities are up to you! Secondly, using Dummy Clips lightens the CPU load because you can send multiple tracks to one effect instead of having multiple instances of the same effect loaded. It is also a non-destructive approach that allows the original signal to keep playing without any interruptions. There are various ways to use Dummy Clips, but in this tutorial we will focus on creating Dummy Clips that trigger each of the Audio Effect Racks we will create in this tutorial. Let’s begin by creating two Dummy Clips for both the Left Out and Right Out tracks. Setting up a Dummy Clip is fairly easy. Essentially, the process evolves creating a new Audio track, routing the audio from another track, setting the Monitoring input, recording an empty Audio Clip, and drawing in some automation for specified device parameters. Luckily, much of this process is completed in the DJ template we created in the first tutorial of the series. Looking at the In/Out Sections for both the Left Deck and Right Deck tracks you will see that the output signal is being sent to the corresponding Left Out and Right Out tracks. In addition, the Monitoring for both Left Out and Right Out tracks is set to ‘In’ to accept the incoming signal. To complete the setup, will require us to create a Dummy Clip for each of the two Audio Effect Racks that we will create in this tutorial, and then draw in some automation to trigger the effect. Let’s begin by creating an empty Dummy Clip in the Left Out track. Arm the track for recording by enabling the Arm Session Recording button next to the Track Volume fader. Click the Record button located within any available clip slot to begin recording an empty clip for a length of 1 bar or more. You can also adjust the Loop Length in Clip View. Duplicate the Dummy Clip and rename one Beat Repeat and the other Dub Delay. Copy the two Dummy Clips over to the Right Out Track. Triggering this effect creates a repeated stutter delay that decays in volume over time. It works great when triggered just before a drop, during transitions, or any other time to break up a beat for adding some variation. The possibilities are up to you! The rack has Macro controls for adjusting the rate at which the repeats occur, size of each repeated slice, and how much the volume will decay over time. In addition, a Sidechain Compressor has been added to duck the volume of the repeated slices from the opposite deck to help keep things in check. Let’s look at how to set up this rack. Load a Beat Repeat device. Macro map the Interval, Grid, and Decay controls to separate Macros and adjust them to taste. For a nice starting point try setting the Interval to 1/4, Grid to 1/8, and 25% for Decay. Enable the Repeat button so that the Beat Repeat will immediately capture material and begin playing repetitions once the effect is triggered. Set the Output Mode to Insert by clicking the ‘Ins’ button. Insert Mode will mute the original signal when repetitions are playing. Optional – Enable the Filter and adjust it to taste, as well as the No Triplets button if you do not want the repeats to occur in triplet beat divisions. Load a Compressor after Beat Repeat. Enable the Sidechain button and choose Right Out from the Audio From menu. Choose Left Out when setting up this rack for the Right Out track. Adjust the Ratio, Attack, Release, and Threshold controls to taste. Now that we have our rack set up, drag it over to the Left Deck FX Rack we created in the first tutorial and place it before the Limiter. Next, Macro map the racks Activator button to any available Macro control on the Left Out FX rack and rename it Beat Repeat. Let’s continue setting up the Fading Beat Repeat Rack by moving forward with the configuration of the Beat Repeat Dummy Clip. Double-click the Beat Repeat Dummy Clip to open Clip View. Locate the Launch box and select Repeat from the Launch Mode chooser menu. The Repeat setting will allow you to sustain the effect by clicking and holding the Dummy Clip’s Launch button. Releasing the button will deactivate the effect. Click the Quantization chooser menu and select 1/16. This setting will capture material on a 16th beat division so that the repeats are in sync with the tempo. Feel free to set the Quantization to any beat division you prefer. Click the ‘E’ button to open the Envelopes box located towards the bottom left of the Live’s interface. Click the Device chooser menu and select Left Deck FX. Click the Control chooser menu and select Beat Repeat. Working in the Sample Editor, draw in the same automation from the image below. The automation will activate the Fading Beat Repeat rack after launching the Dummy Clip and then deactivate the rack after releasing the Clip Launch button. Repeat the steps above for the Right Out track. Bada bing bada boom, our Fading Beat Repeat rack is ready for action. Let’s give it a test run by launching the Beat Repeat Dummy Clip while playing back some music. Michael Walsh | Strobe Light (Disco Light Acid Black) released on Plastic Love Records. Check out the Before When It Was New EP by Michael Walsh HERE. The second Audio Effect Rack we will create is used to trigger extended dub-style delays that trickle through a mix adding excitement and movement. This punch-in effect works great during transitions and breakdowns. Check out our Ableton Live Dub Delay tutorial and follow the step-by-step guide on how to create the same dub-style delay effect rack we will use in this tutorial HERE. Once your Dub Delay rack is ready, drag it over to the Left Deck FX rack and place it before the Limiter. Next, Macro map the Delay On/Off Macro control to any available Macro on the Left Out FX rack and rename it Dub Delay. Let’s continue setting up the Dub Delay rack by moving forward with the configuration of the Dub Delay Dummy Clip in a similar fashion as the previous Rack. Double-click the Dub Delay Dummy Clip to open Clip View. Click the Launch Mode chooser menu and select Repeat. Click the Quantization chooser menu and select 1/4. Click the ‘E’ button to open the Envelopes box. Click the Control chooser menu and select Dub Delay. Working in the Sample Editor, draw in the same automation from the image below. The automation will activate the dub-style delays after launching the Dummy Clip and then slowly fade them out to silence before finally deactivating the rack on its own. There is no need to click and hold the Clip Launch button for this effect. The Dummy Clip does all the work! Rub a dub dub, one Dub Delay rack in the tub. Let’s give it a test run by launching the Dub Delay Dummy Clip while playing back some more music from the Before When It Was New EP. Michael Walsh | Before When It Was New (Original) released on Plastic Love Records. MIDI Mapping the Dummy Clips to your favorite controller is quick. Click CMD [MAC] / CTRL [PC] + M to enter MIDI Map Mode and map each of the Dummy Clip Launch buttons to separate buttons on your controller. Nice, that brings the record to a stop for the second tutorial in a series on building a DJ template. The next and final tutorial in the series will focus on building a smart mixing fader for seamless transitions. In the meantime, I encourage you all to experiment with the template, have fun, and impress your fans on the dance floor!